thanks, this is the one i later scaled down and placed onto what will become a hand mirror, shown somewhere else in another thread. i love a happy ending. ! 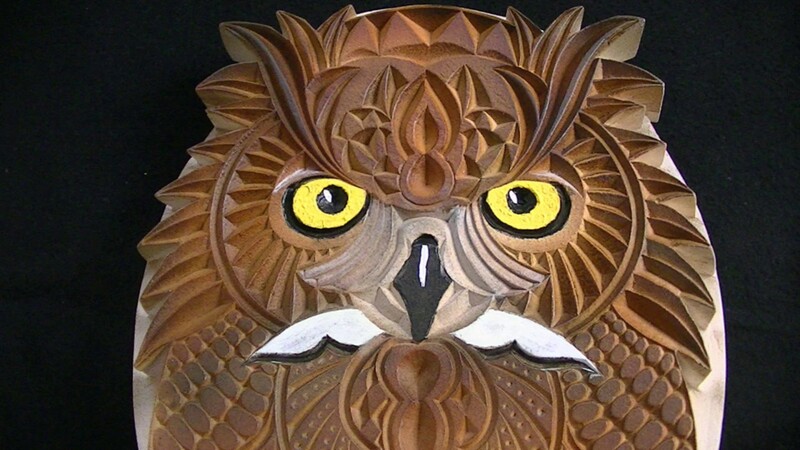 drhandrich "i purchased it from the wood carving show done in Wisconsin a couple week ago. " I was able to contact Marty and he was kind enough to send me a copy of the pattern. Thanks for the info! now here is a guess i just thought up. keep in mind, first time using an airbrush. i was using bottled acrylic instead of tube, I think that is thinner . plus i then thinned it down 50/50 to go through the airbrush without stopping or spitting. . so it went on saturated actually. at one end of coloration i had Misted bright orange over dark brown. it showed up nicely as i did it. I wonder if the extra wet paint and time to dry duration. maybe the overcoat mist rekindled the base coat pigments and they blended themselves while drying. i seldom use bottled acrylic, never used mixed 50/50 with water. and first time with airbrush.. after it had dried i hand brushed on the vivid colors on the face and i noticed i needed 4 coats straight paint, to get color coverage. anyone out there with airbrush experience ever notice this before? Well, it may not have the color variations that you were looking for, but it not bad. A person hates to experiment on things that they want to keep. But at least you have a starting point.